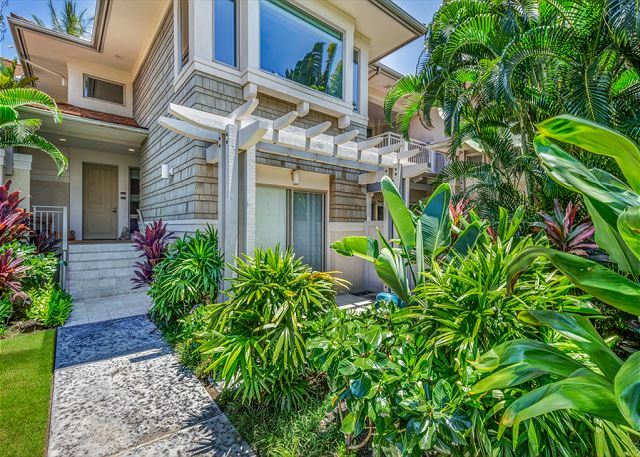 Palm Villa 140B – Luxury Vacation Homes, Inc. 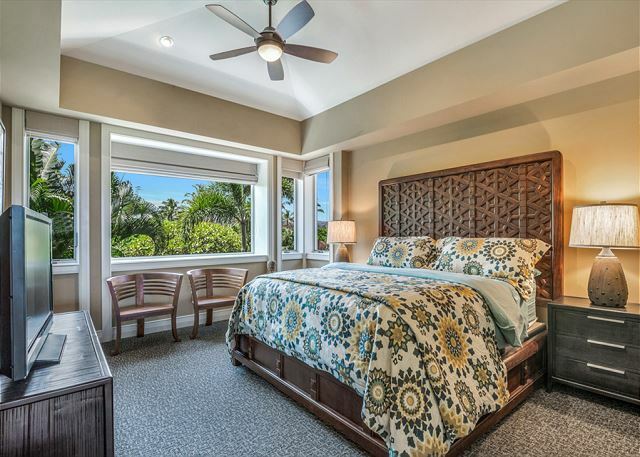 Spectacular three bedroom, three bath, two-story town home on popular Waiulu Street at the world renowned Hualalai Resort. 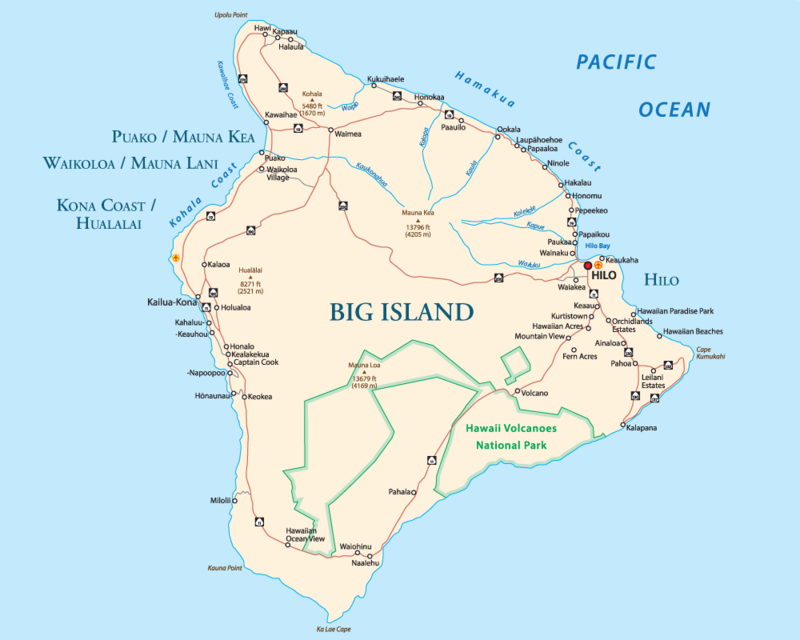 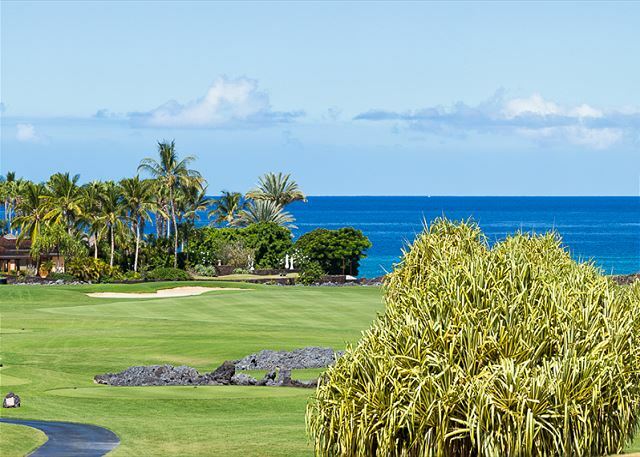 Hualalai Resort is home to the Four Seasons Hotel, regarded by many as the #1 Resort in Hawaii. 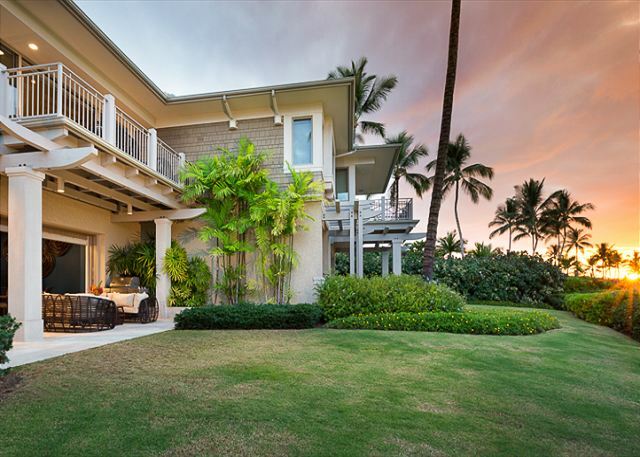 This exclusive Palm Villa is on the Four Seasons Resort property and just minutes by golf cart from the hotel’s front door. 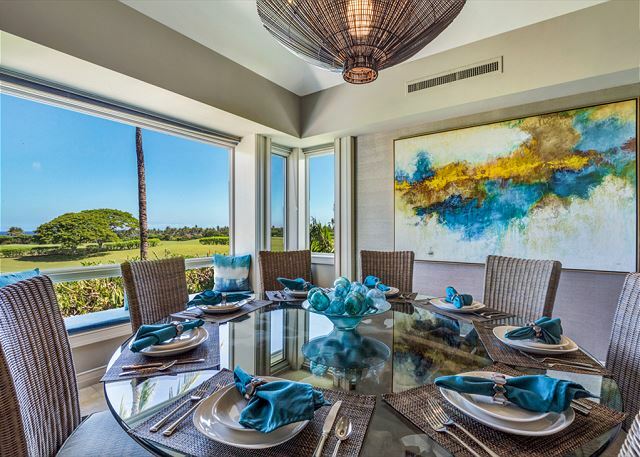 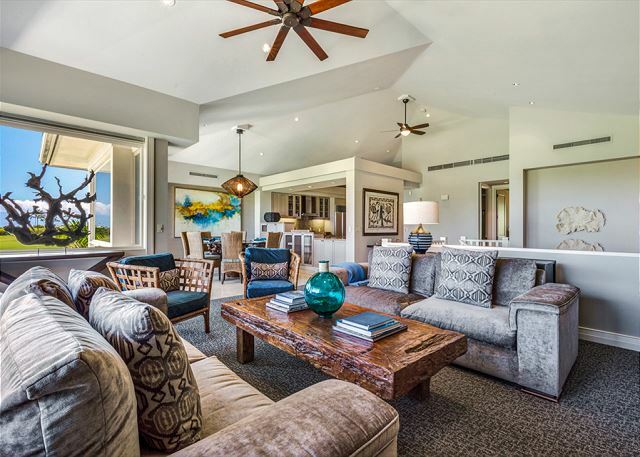 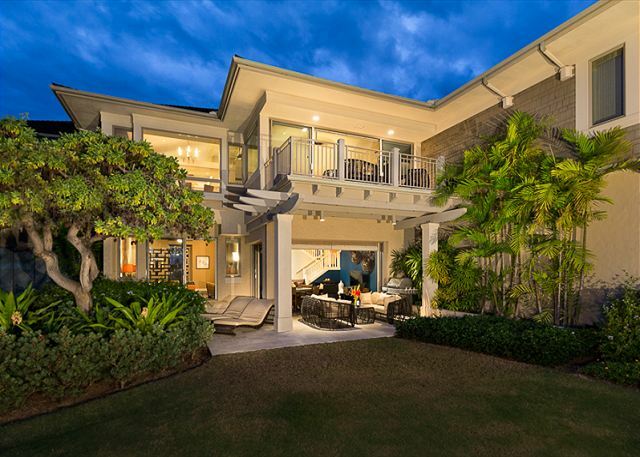 Situated on the 15th hole of Hualalai’s Jack Nicklaus designed Hualalai Golf Course with ocean views, there is nearly 3000 sq feet of indoor living area, including an open ‘great’ room upstairs, AND a separate living room downstairs. 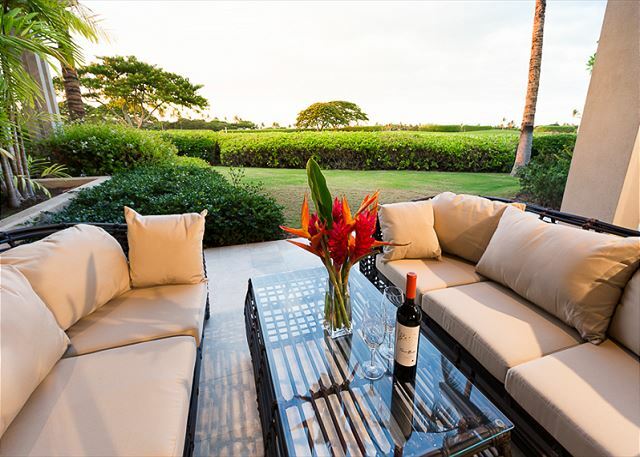 This beautiful villa is the perfect set up for the discerning traveler. 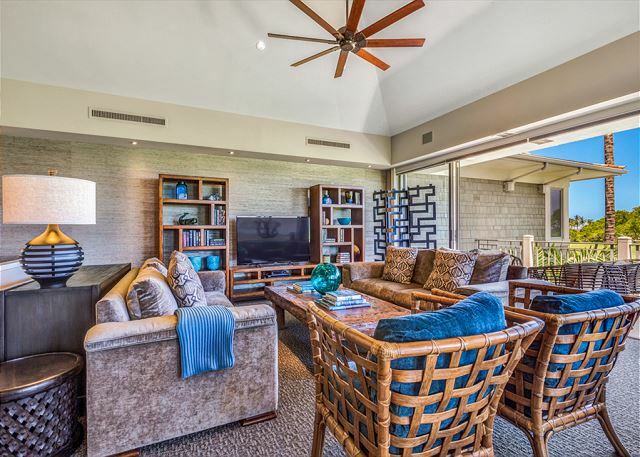 In addition to a spacious indoors, there are 3 sizable patios ( including one large covered space) making this one of the largest private villas at the Resort. 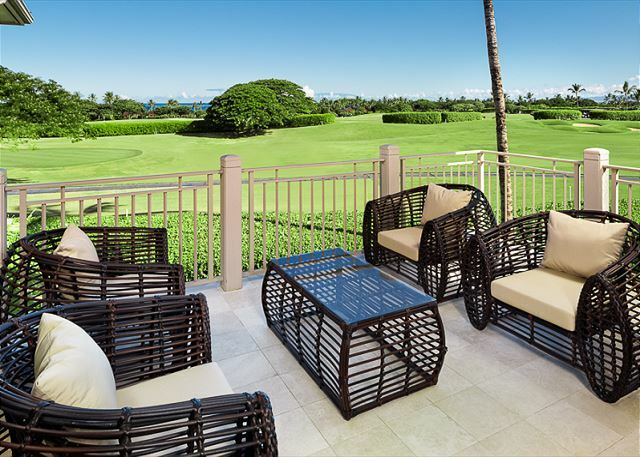 The oversized downstairs lanai opens to a manicured lawn area, and there’s an ocean view terrace on the 2nd floor with either golf course or water views from most rooms. 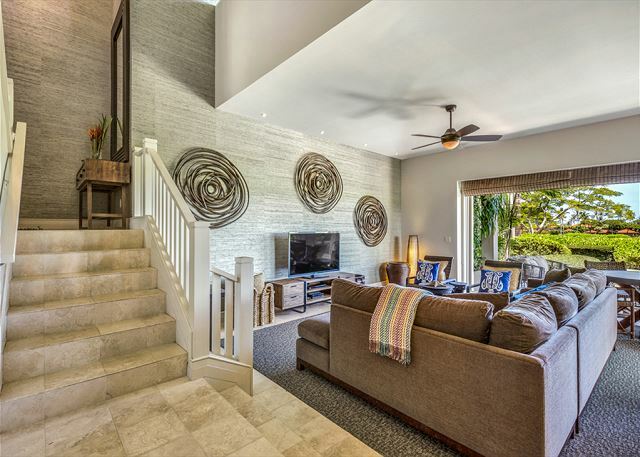 This property has undergone a recent renovation with new flooring, paint, furnishings and artwork done by a top design team. 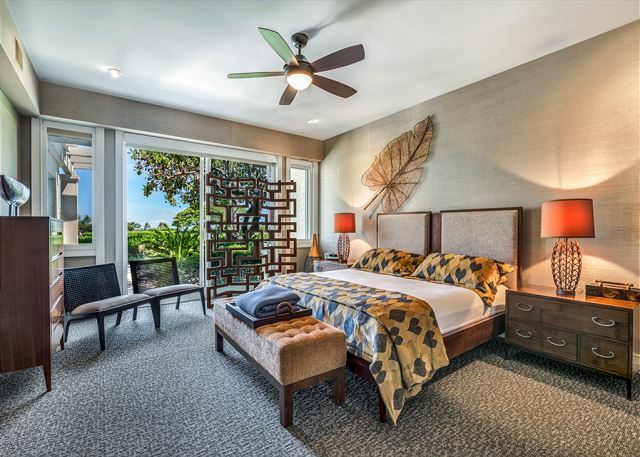 High quality bedding, linens and bathroom amenities make this the ideal place to relax and enjoy luxury offerings as if you were staying at the Four Seasons itself, while having full Hualalai Resort priveleges: the best of both worlds! 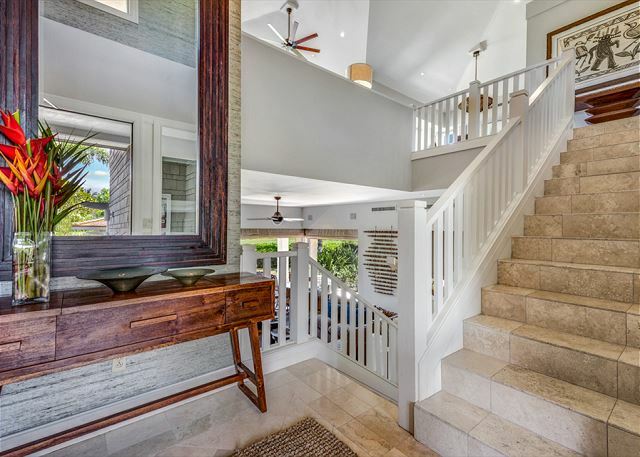 Spectacular, large view windows and soaring vaulted ceilings give the property extensive natural lighting while the finishes are done with exquisite detail. 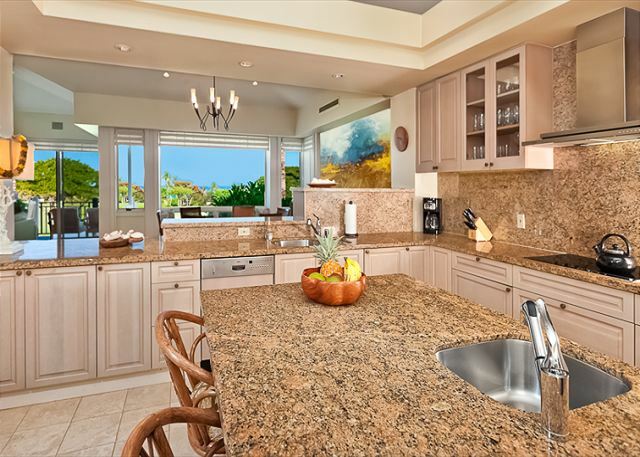 The kitchen is well-equipped with everything to make yourselves at home. 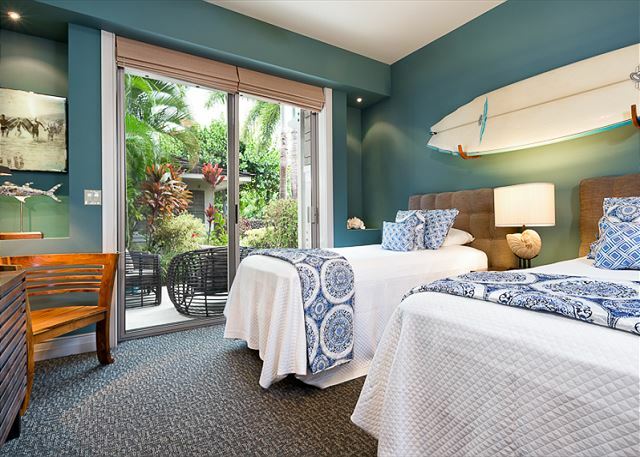 Guest rooms offer King – King and Twin bedding, each with its own luxury bathroom. 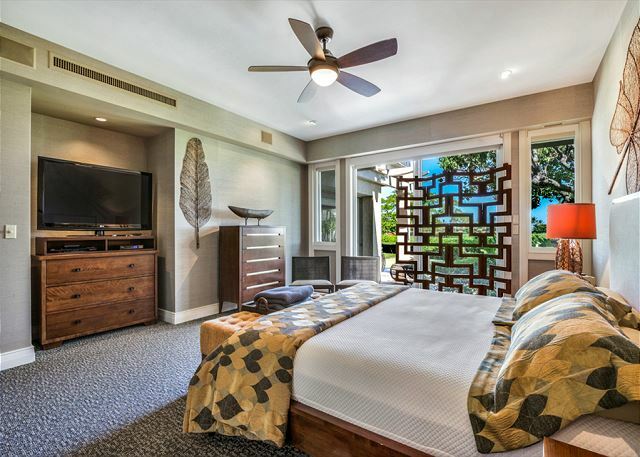 Flat screen televisions are available in each of the rooms while 2 golf carts provide easy and quick access to the Sports Club & Spa, Hualalai Golf Club, 4 restaurants and the hotel (just 3-4 minutes by cart). 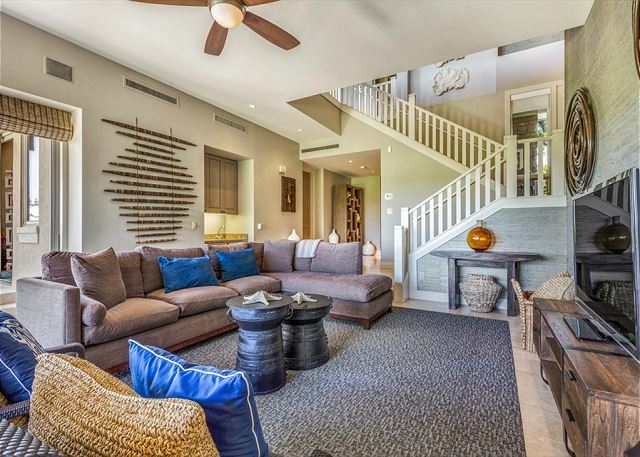 Guests of this villa enjoy its prime location and the spaciousness of an open floor plan that still offers many private spots to retreat and relax. 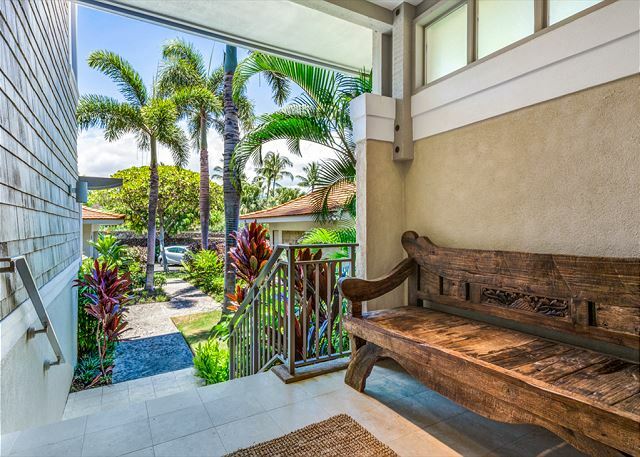 All this in less than a 15 minute drive from the airport!! 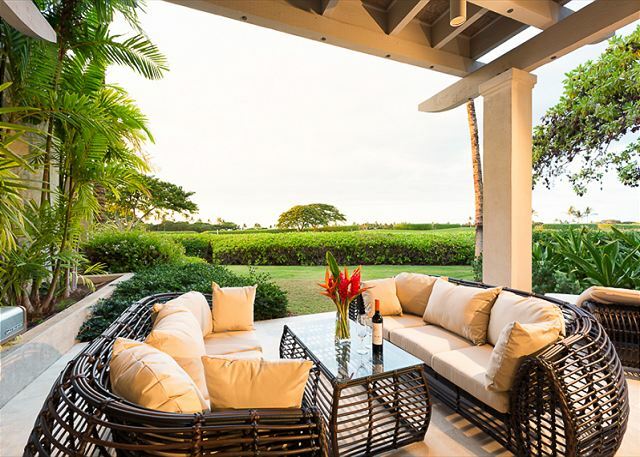 It’s ideal for your next Big Island trip and one of Hualalai’s most popular villas – come enjoy!